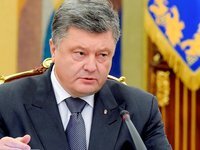 Ukrainian President Petro Poroshenko has said that the Pension Fund received UAH 5 billion in pursuance to the law on customs clearance of cars with European number plates. He ordered the prime minister and the head of the Pension Fund to shape proposals on indexation of pensions thanks to these revenues. "It is about replenishment of the Pension Fund. UAH 5 billion has already been received by the Pension Fund," the president said in a meeting on the results of the law that allows the legalization of cars with European number plates imported in violation of customs and tax legislation, the press service of the president reported. Poroshenko called on car owners with foreign registration to take advantage of the last days of the grace period for the legalization of these vehicles. This will not only fill the budget of the Pension Fund directly, but also allow the indexation of pensions, he said. Poroshenko said that there were actually 11 days left until the end of the grace period for customs clearance of such cars. "Now the pace is good," he added. The president said that the given indicator was much higher than what the experts had predicted when planning budget revenues. "This allows us to resolve the issue of indexation of pensions that were not indexed in 2015-2016 due to circumstances - military and budget ones," the head of state said. Poroshenko appealed to Prime Minister of Ukraine Volodymyr Groysman and Head of the Pension Fund Yevhen Kapinus to make suggestions on indexation based on the available indicators. "So that we prepare positions on the protection of those who have been affected the most - pensioners who receive a minimum pension. In order to find an opportunity to use the funds received from customs clearance of cars, to solve this acute and painful social problem," the president also said.